Multicharts or MC as it is fondly referred to by traders is a professional grade charting and trading platform that is independent of the broker. Priced at $1497 for a lifetime purchase or a monthly subscription cost of $297, the hefty price tag has not discouraged traders from accessing the full features of this professional trading and charting platform. Multicharts has won many awards as one of the best technical analysis platforms and is supported by a number of brokers including Oanda, Dukascopy, LMAX to name a few. For this review, we are using a Free trial version of Multicharts, which can be accessed from here. The trial period allows you a 30-day access to the full version of Multicharts and also gives sufficient time to get familiar with the trading/charting platform. How to generate Renko charts with Multicharts? Multicharts supports native Renko charts on the platform, making it easy for traders to quickly switch to and from Renko charts with relative ease. 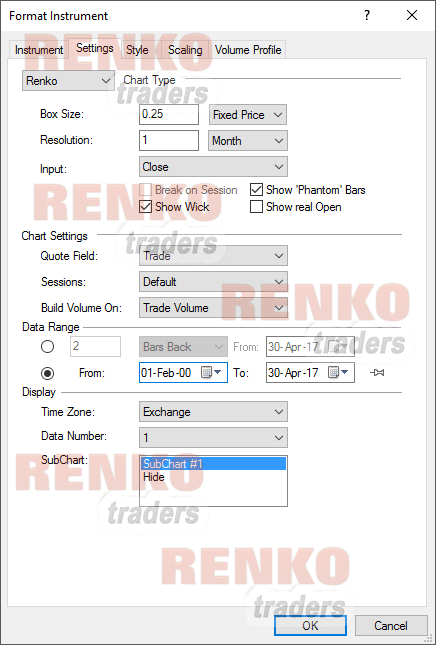 To convert an existing default chart type (bar chart or candlestick chart) to Renko chart, simply click on the ‘Renko’ icon on the menu bar. This is not hard to miss as it allows for a ready switch to other chart types such as bar, candlestick, line, line-break, renko, kagi, point and figure and heikin-ashi charts to name a few. Clicking on the ‘Renko’ icon however requires one to configure the chart history as well. To do this, right click on the chart, and select ‘Format Instruments’ option which opens a pop-up window. From here, select the ‘Settings’ tab from where you can change the configurations. The first step is of course in setting the box size. Unfortunately, there are only two options to choose from here. The first is a fixed box size and the second option is to set a percentage change. There is no option for ATR. So traders need to give it some thought before choosing on which of these two options to choose. In this review, we focus on the fixed price. The resolution option can also be changed. Here, we make use of a 1-month period. The resolution is nothing but the base time frame from where the Renko charts will calculate the closing price. Because we are using a trial version, we are limited to daily/weekly and monthly resolution. You can learn more about base time charts and its importance in Renko charts here to get further clarity on this aspect. Other options including enabling/disabling the wick as well as building the price history. It is highly recommended to select a decent amount of history when switching to Renko charts. Once the Renko settings are confirmed, wait for a while for the Renko bricks to populate the chart as shown in the next image. You can right-click and select format window in order to customize the chart colors and configure other cosmetic changes. So far so good and it is relatively easy as one can see. The Multicharts platform offers a vast collection of technical analysis studies and drawing tools. The bottom part of the chart comes with a default setting of some standard drawing tools that are easy to access. The chart below illustrates some standard drawings on a 150 point Dow Jones Index Renko chart. There is a good selection of drawing tools that includes Fibonacci retracement, Andrews Pitchfork, arc, free hand drawing and chart annotations. The next chart below illustrates some basic indicators, mainly the Bollinger bands and the Stochastics applied to the Dow Jones Renko chart. Adding the indicators is very simple and one can see indicators both on the price chart as well as in a sub-window. Besides the above handy features, Multicharts also enables you to back test and run automated trading strategies directly on the native Renko charts available with Multicharts. Multicharts does a reasonably good job when it comes to offering Renko charts as a native chart type. However, there is a lot left to be desired in terms of the flexibility and control one has on the Renko chart type from Multichart given the hefty price tag that comes with this charting/trading platform. However, if Renko chart isn’t your only type of analysis, Multicharts is a fairly decent trading and charting platform that is available for traders. But beside the usual, there is nothing fancy or out of the ordinary that comes with Multicharts platform.